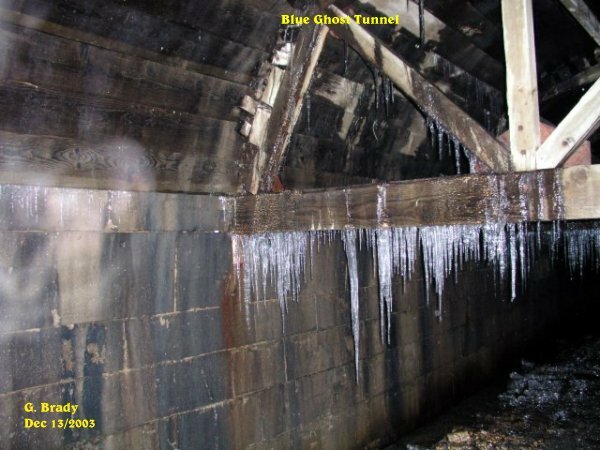 We did not plan to return to the Blue Ghost Tunnel this night. In fact we were to go to another location, but a friend of ours had wanted to meet up with us and go to the tunnel. We were to meet up in St. Catharines. Well they did show up but after a conversation about whether ghosts or spirits can cause harm our friend backed out at the last minute. So Cathy, myself and Cindy carried on to the tunnel ourselves. We traveled this far, might as well conduct another investigation to this wonderful place. After our arrival at the tunnel we thought we were all used to this place. However there seemed to be something that gave us second thoughts about going in. It seemed darker outside of the tunnel this night for some strange reason. 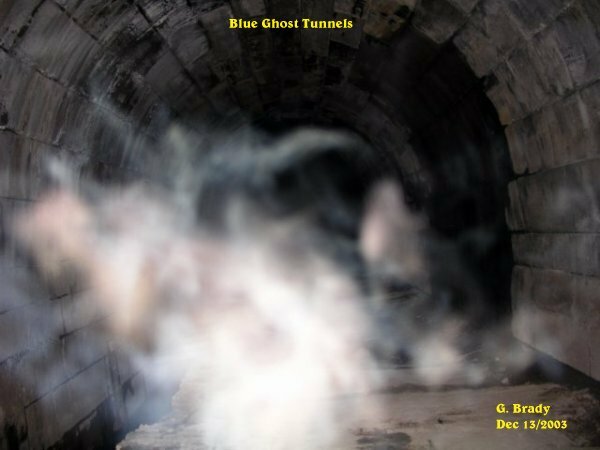 There also seemed to be something strange within the tunnel that gave us the shivers. After talking for awhile and taking some pictures I felt a slight tug on my coat. After taking this picture I could not help wondering if this spirit had anything to do with it. 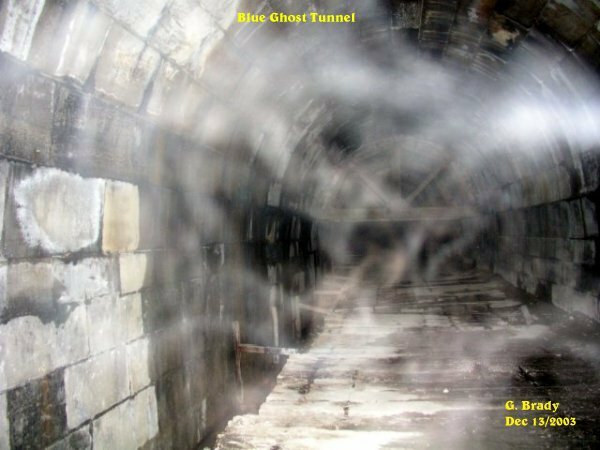 This spirit seemed to have horns coming from what appeared as a head of a demon looking creature starting to form in front of me. This ecto form had vibrant colors of energy within the mist. 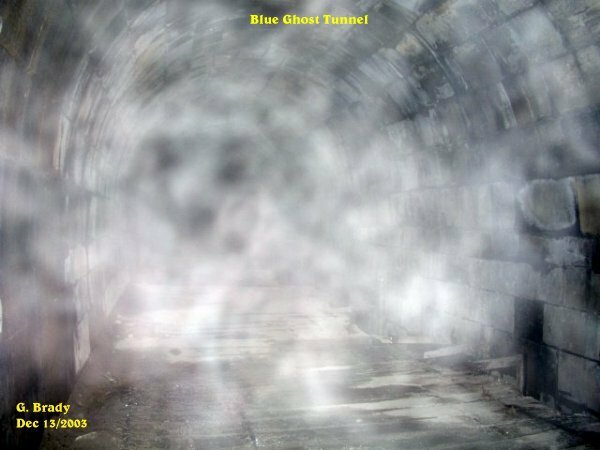 It is all guess work when trying to figure out what a spirit is trying to show a person. Everyone sees something different in a picture. This spirit form (in my opinion only) seemed to be very strong. It almost looks like some kind of serpent with two large eyes coming from the body. This energy form also had a tint of green to it, like the one from the other night. 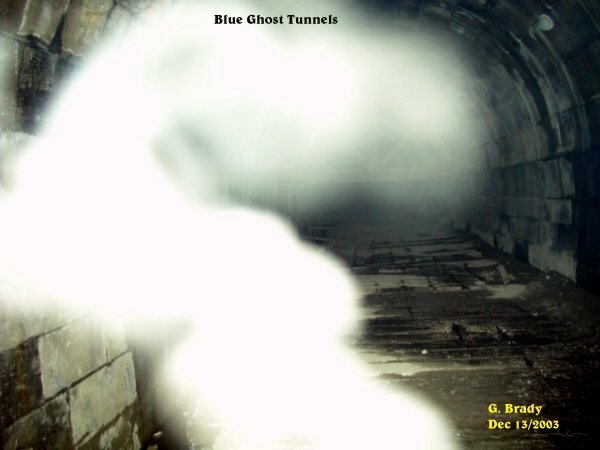 In this photo it appears as though there were a few spirits that were forming near the support beams of the tunnel. In the center of the ecto mist it almost appears as a dog's head, complete with two large eyes and the muzzle of a dog. I got closer to the support beams and took this picture. 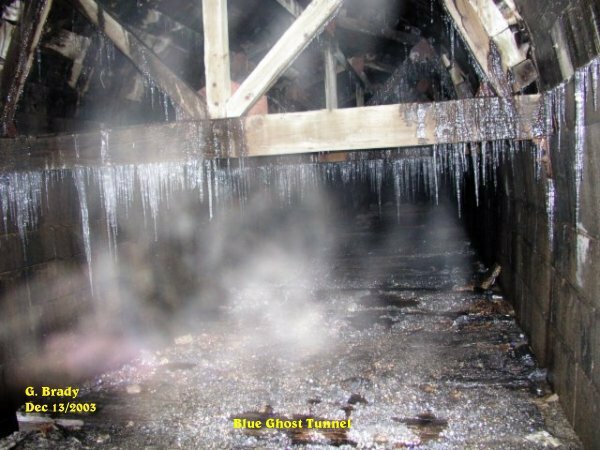 This picture shows some strands of blue ecto plasm a few beams back from where I was standing. 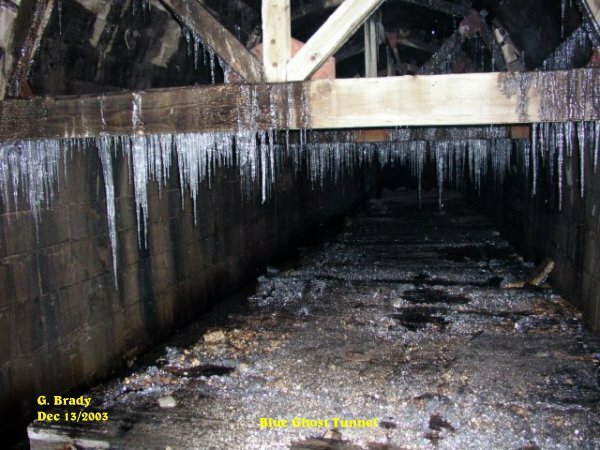 Inside the tunnel on some of the support beams there was ice and a strange mist seemed to be forming along the ground that only appeared in a few pictures. Now there is nothing paranormal in this photo. I wanted to show you, the viewer, how clear this shot is where the ice was. 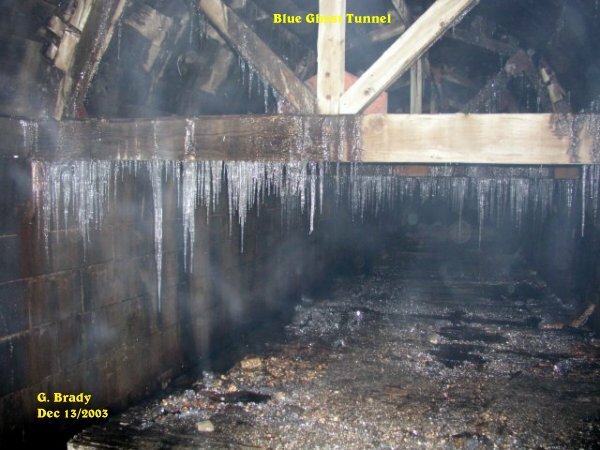 The mist in the last picture was not created by the ice or cold within the tunnel. Just to the left by one of the beams a circular form was taking shape. This form had a lot of energy to it by showing in different colors. 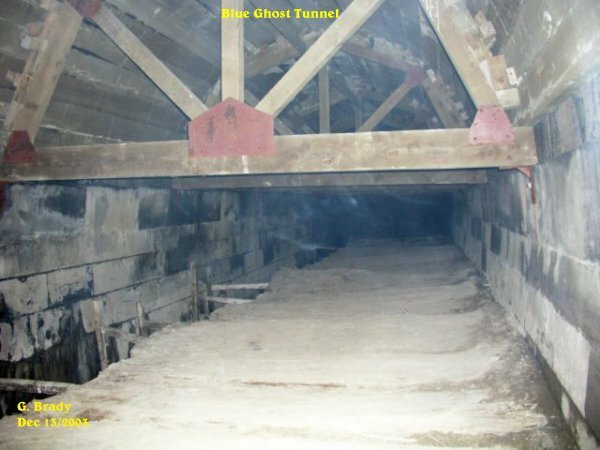 A minute later this picture was taken and the form you saw in the last photo seemed to have gotten bigger and started to go along the floor of the tunnel. While we were in the tunnel we all heard what sounded like a jet going over head, but the sound got louder and then different tones started to get louder at the other end. We looked at each other and listened. Then we all had the urge to step back away from the beams for the sounds seemed to be coming towards us. 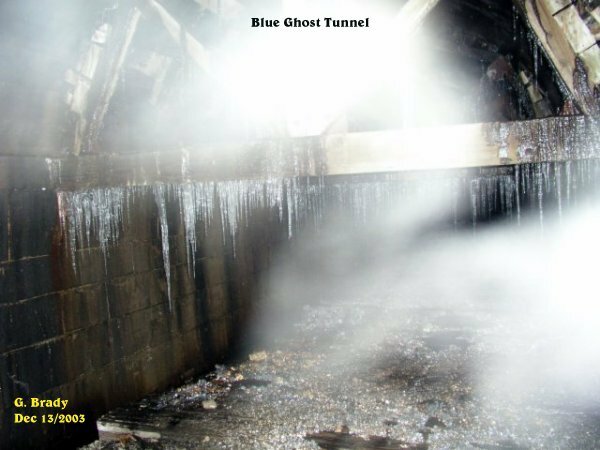 The sound is hard to described but it sounded like a bunch of spirits with low and high pitch tones coming from the other end. I took this photo while the sounds seemed to get closer to us. Then as we stepped back the sounds came to a slow stop.